Powerful, compact, energy-efficient and safe in operation - all these are features of the new Palma electric fan heater by BIO GREEN. Its robust housing is constructed largely from stainless steel. 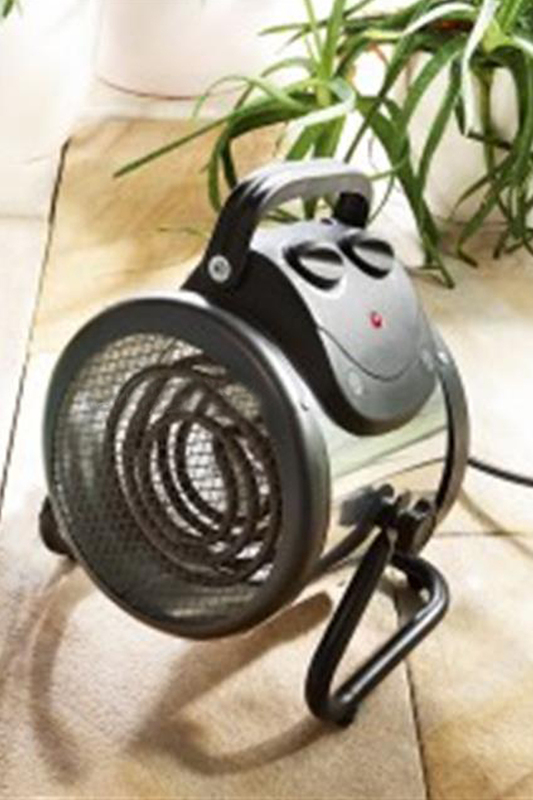 With its timeless design, this floor-standing heater looks good in any situation. Palma is also the ideal solution for the smaller greenhouse where space is at a premium. Thanks to its compact design, slip-resistant rubber feet and practical carrying handle, it can be used almost anywhere. Palma has an unrivalled output of 2000 W and air circulation rate of 163 m3/h, ensuring that the warm air is very rapidly and evenly distributed and that the temperature in your greenhouse is always maintained at the right level. The digital thermostat even allows you to select temperatures in the minus range. Thanks to the heater's temperature accuracy (+/-2°C), energy consumption is surprisingly low, saving you money. The portable, robust Palma meets very stringent safety standards; it has IPX4 protection and is thus splash-proof in all directions and can also be used in damp rooms, such as greenhouses, cellars, garages, workshops, warehouses and music rooms. This adaptable all-rounder can even provide cost-effective additional heating in living areas.